David was GWAV’s Secretary from 1993 until 2006. He held office as NAVA's Corresponding Secretary for 1996-1997 and First Vice-President from 1997 until 1999. He also hosted their 1998 convention in Quebec City and NAVA 34 in Lansing, Michigan in 2000. David has done extensive research on Michigan municipal flags as well as flag protocol. Originally from Detroit, David currently resides in Chicago. In 1996, he joined forces with John Purcell to produce the GWAV journal Flagwaver and continues to be one of its co-editors. John has been interested in flags since childhood. 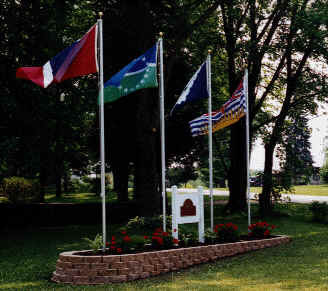 He joined the North American Vexillological Association in 1969, three years after its founding. He has served in a variety of offices, including President. He was awarded NAVA's Whitney Award at the 18th International Congress of Vexillology meeting in Victoria, B.C. John is a founding member of GWAV, and is a co-editor of Flagwaver, GWAV's semi-annual journal. He is also a past Vice-President and Secretary of GWAV. He is presently a member of the editorial board of NAVA's annual journal, Raven. John has published a number of articles in his area of special interest, civic flags, with particular attention to his home state of Ohio. He was a Professor of Spanish and foreign language education at Cleveland State University until his retirement. Peter co-owns FLAGGS USA in Cincinnati, Ohio, a retail flag and banner shop with two Cincinnati locations. The stores are in Oakley Square and Fairfield by Jungle Jim's Food Market. He is a past Convention Host (1995) of NAVA and past President of GWAV (-1999) His primary interest in flags is retail but he does have a large collection of city flags in miniature, advertising specialties and souvenirs with flags on them. I collect anything in the 4 x 6" size, countries, states, counties, cities, sports teams, and special events. I have over 3,000 different flags in my collection. I also have a flagpole in front and being an avid university of Kentucky fan I fly the U.K. flag on game days. During Kentucky Derby week I fly the Derby flag. Truman Pope, Muncie, Indiana, joined NAVA in 1996 and GWAV in 1997. He is a past Secretary of NAVA and past President of GWAV. His interest in flags stems from his activities with the Boy Scouts where he was known as "the flag person", having a number of foreign flags flying at his troop's campsite. He served as International Representative for his local scout council as well as Vice-President/Scouting and took scout patrols to New Zealand and England. He was Scoutmaster for an all Eagle Scout troop attending the Eagle Bi-Centennial in Washington, D.C. in 1976. He retired as Manager of Real Estate and Property Insurance at Ball State University after serving over forty years and was named a Sagamore of the Wabash by Governor Evan Bayh. He is also a Kentucky Colonel. He serves with an American Legion Color Guard at veterans' grave services and usually holds one of the two flags. He was a sergeant in the Corps of Engineers during the Korean War. His interest is in national flags and he flies four flags daily, either national or state or provincial flags. With the Promex Company in Germany. The company sells custom made flags, pins, paper clips, lanyards, magnets, air sticks, and armbands.